Here's a little hors d'oeuvre my husband made last night that was deliciously worth sharing. 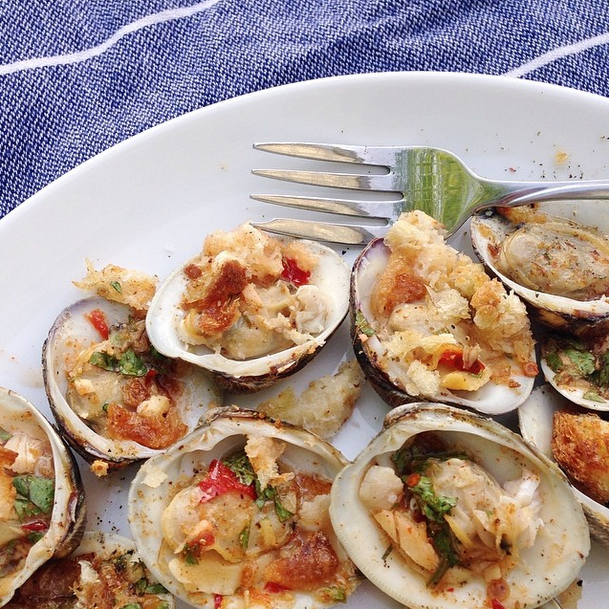 Think of it as an Asian spin on clams casino. Preheat the oven to 350 degrees. Mix the ginger, garlic, pepper and sweet chili sauce in a small bowl and set aside. Place the clams on a baking sheet and bake for about 2 minutes, or until they begin to open. Take them out of the oven and shuck them by removing the top shell and leaving the meat in the bottom shell. Spoon a small amount of the ginger mixture on top of each clam. Top with bread crumbs, chopped cilantro and drizzle with butter. Turn the oven up to broil and cook the clams until the breadcrumbs begin to brown and the clams are cooked, about 5-7 minutes (depending on your broiler). Top with a squeeze of lemon and serve on the half shell.